Thomas Jefferson Davis Bridges (December 28, 1906 – April 19, 1968) was an American right-handed pitcher in Major League Baseball who played his entire career with the Detroit Tigers from 1930 to 1946. During the 1930s, he used an outstanding curveball to become one of the mainstays of the team's pitching staff, winning 20 games in three consecutive seasons and helping the team to its first World Series championship with two victories in the 1935 Series. He retired with 1674 career strikeouts, then the eighth highest total in American League history, and held the Tigers franchise record for career strikeouts from 1941 to 1951. Born in Gordonsville, Tennessee, Bridges attended the University of Tennessee, and after having a 20-strikeout game for the minor league Wheeling Stogies in 1929, he joined the Tigers in 1930, inducing Babe Ruth to ground out on his first major league pitch. On August 5, 1932, he came within one out of throwing a perfect game. With two outs in the ninth inning, and the Washington Senators trailing 13–0, the Senators pitcher was due to bat. Washington manager Walter Johnson sent pinch hitter Dave Harris to bat, who led the AL that season with 14 pinch hits. Harris hit a single to break up the perfect game. Bridges had another one-hitter against the Senators, on May 24, 1933. On September 24, 1933, Bridges reached the ninth inning with a no-hitter for the fourth time in two years. This time, he gave up a pair of hits but beat the St Louis Browns 7–0. For the 1933 season, Bridges had a 3.08 earned run average (ERA) (140 Adjusted ERA+), second-best in the American League. In 1934, Bridges was 22–11 with 23 complete games to help the Tigers win their first pennant in 25 years. Bridges also surrendered Ruth's 700th home run on July 13, 1934. In the 1934 World Series, Bridges pitched a complete game victory, in a pitching duel with Dizzy Dean. Bridges beat Dizzy Dean 3–1, but the Tigers lost the Series in seven games. In a nationwide poll Bridges was named the No. 2 sports hero of 1935, behind Notre Dame football player Andy Pilney. After winning over 20 games in both 1934 and 1935, Bridges led the AL in 1936 with 23 wins, and finished ninth in the MVP voting. Also in 1934, Bridges gave up Babe Ruth's 700th career home run. On August 11, 1942, Bridges was involved in one of the great pitching duels of all time. Cleveland starter, Al Milnar had a no-hitter until Doc Cramer singled with two out in the 9th. Milnar's scoreless duel with Bridges ended in a 14-inning scoreless tie because the rules did not permit the game to be continued under the lights. Bridges was one of the best pitchers in baseball from 1931 until 1943, when he entered the Army. He was among the league leaders in ERA 10 times between 1932 and 1943, including a career-low 2.39 ERA in 1943—the year before Bridges entered the Army. Over his major league career, he compiled an Adjusted ERA+ of 126—ranking 54th best in major league history. Though his unadjusted ERA is less impressive because of the high batting averages in the years in which he pitched, Bridges had an Adjusted ERA+ in excess of 140 on six occasions: 1932–33, 1939–40, 1942–43. He was named an All-Star six times between 1934 and 1940, missing out only in 1938 due to an injury. Bridges was also a consistent leader in strikeouts. He led the AL in strikeouts in 1935 and 1936, and was among the league leaders 12 times: 1931–40, 1942–43. Even more telling, he was among the top three in the league in strikeouts per nine innings pitched on 7 occasions: 1931, 1935–36, 1939–40, 1942–43. In 1941, he set the Tigers career strikeout record, surpassing George Mullin's mark of 1380. His team record for career strikeouts was broken in 1951 by Hal Newhouser, and remained the top mark for a right-hander until Jack Morris broke it in 1988. Bridges' career record with the Tigers was 194–138 with a 3.57 ERA. Bridges served in the U.S. Army during World War II, missing the entire 1944 season and coming back in time for only one start in 1945. He was a member of the Tigers 1945 World Series championship team, his fourth Series, making a relief appearance in Game 6. Bridges and Hank Greenberg are the only players in Detroit Tigers history to play in four World Series for the team, having appeared in the 1934, 1935, 1940, and 1945 World Series. 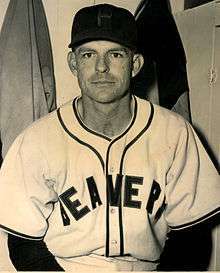 Sent to the minors in 1946, he pitched for four years with the Portland Beavers in the Pacific Coast League. On April 20, 1947, pitching for Beavers, Bridges finally got his no-hitter, beating San Francisco 2–0. Bridges also led the Pacific Coast League in ERA in 1947, but never pitched in the majors again. Bridges' life outside the major leagues took a downward turn, in part due to alcoholism which developed during his war service. In 1950 Bridges left his wife for another woman; former teammates were shocked by his appearance. In 1951, he became a scout and coach for the Cincinnati Reds, and he was later a scout for the Tigers, and New York Mets. Bridges died in Nashville, Tennessee in 1968 at age 61. ↑ "Tommy Bridges". Baseball Library. Retrieved June 27, 2014. ↑ "Tommy Bridges". SABR. Retrieved June 27, 2014. ↑ Berger, Ralph. "Tommy Bridges at SABR Baseball Project". SABR. Retrieved June 27, 2014. ↑ James, Bill (2001). The New Bill James Historical Baseball Abstract. Simon & Schuster. p. 901. Retrieved June 27, 2014. ↑ "Tommy Bridges dies". The Spokesman-Review. Associated Press. April 20, 1968. Retrieved June 27, 2014.